This class is a pre-requisite for Certificate of Training Course. Sessions also recorded for review or for those not able to participate in live training. Recordings are available for 10 weeks following program completion. Slides and handouts are yours to keep. Combo Course Discount Available: Foundations and COT – Click here! 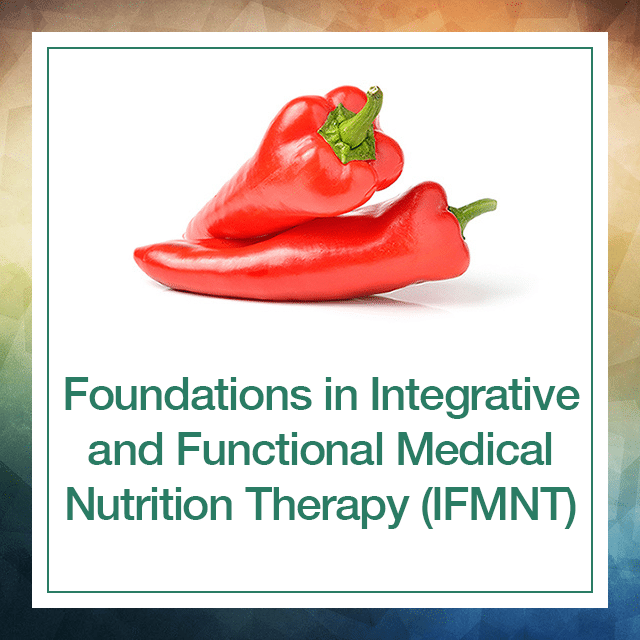 Foundations in Integrative and Functional Medical Nutrition Therapy (IFMNT) 8-week series online training. Offering the basics of IFMNT, the Foundations series is a comfortable but deep immersion. No quizzes/tests; no pressure – just a get-your-feet-wet experience to see what it’s all about and best prepare for the IFMNT Certificate of Training, if you choose to go further. While this series is optional for those with previous training or experience, we highly recommend anyone not already practicing IFMNT start with Foundations, so nothing is missed! Get the basics just to incorporate a bit of IFMNT into your existing practice or let this be the beginning of an exciting journey that will expand your career to new heights – guaranteed! For more info on course content, go here. This training is different! Since our courses are held as live and interactive webinars (versus other programs that offer repeat recordings), our content is consistently updated and expanded. Research is continually reviewed and the that means our live training is evidenced-based, cutting-edge and hot off the press. Not just book learning, but a rich display of the practical application of IFMNT. Susan Allen-Evenson brings a keen element of mentoring with her 28 years of clinical experience and IFMNT know-how. It’s almost like you’re in the clinic with her getting first-hand experience! Tuition includes several customizable handouts, additional learning links, and a private class Facebook page for networking with your peers and discussion between webinars. BONUS: Each registrant receives a free 30-minute mentor session with Susan Allen-Evenson! Already have training? – You may qualify to skip this Introductory series and move right into the main Certificate of Training in IFMNT. Contact us to learn more. Combo Course discount: Want to save even more? Combine this course with IFMNT Certificate of Training series and save an additional $100! Student pricing: Students receive NLFN Emerald membership for their first year free! Subsequent years while still in school, membership (at whatever level you choose) is 1/2 off. In addition, students are able to take the IFMNT Foundations course for 50% off price – $224 (Note: this option cannot be combined with any other offers), and membership gets you another 10% off all courses. More membership info here: https://www.nextlevelfunctionalnutrition.com/memberships/ Contact us to learn more. Group Discount – Groups of 5 or more from the same institution or practice receive an additional 5% off – One payment must cover all applicants. This can be in addition to the 10% member discount. Contact us to learn more. IFMNT Alumni students – Repeat a training course to get all the new updated and expanded content – Request our IFMNT alumni registration form with very special savings just for Alumni students! Contact us to learn more. Military – VA dietitians and any clinicians serving in the military are eligible to receive a 10% discount towards training programs, and this discount may be used in tandem with the 10% NLFN Member discount. Contact us to learn more.